I enjoy spending time preparing meals. I really do. I love carefully preparing vegetables, lovingly reducing vegetables and stock to a thick sauce, arranging delicious meals with a complex blend of flavours to make utterly delicious meals. And sometimes, I like egg and chips. This is a real throw together. It’s cheat cookery. And it tastes like comfort, like your mum making your favourite food when you’re poorly and need cheering up. It just tastes….lovely. 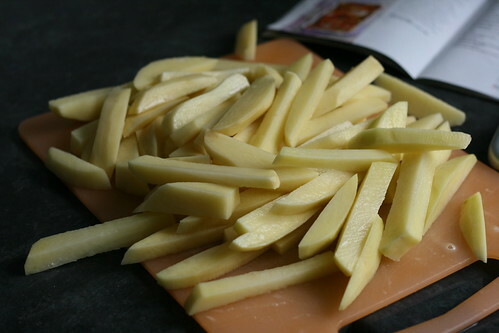 Preheat the oven to 240C, peel the potatoes and cut them into chips like so. Boil them for five minutes and drain well. 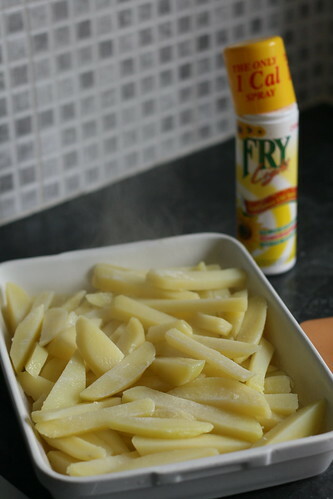 Spray an ovenproof dish with Fry Light, tip in the chips, spray with Fry Light again and shake to rough the edges up. Then spray with Fry Light again. Fry Light is your friend, here. 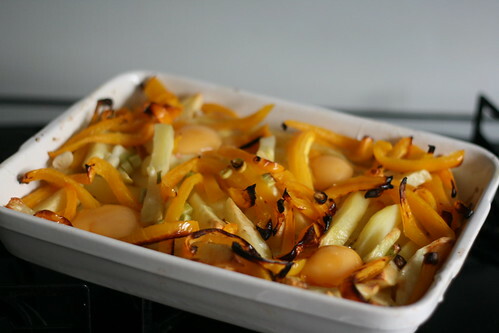 Pop them in the oven for ten minutes whilst you prepare the rest of the vegetables. Deseed the peppers and slice both them and the spring onions thinly. When the chips have been cooking for ten minutes, add the peppers and sprinkle the spring onion over the top with a good twist of black pepper. Spray with Fry Light again. 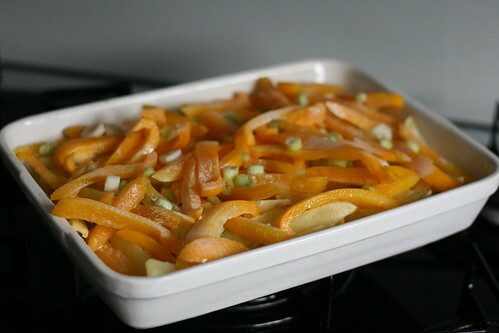 Bake for another 15 minutes, then take the dish out of the oven. Make four “wells” in the chips and peppers (one in each corner, roughly, so each person gets one) and crack an egg in each one. 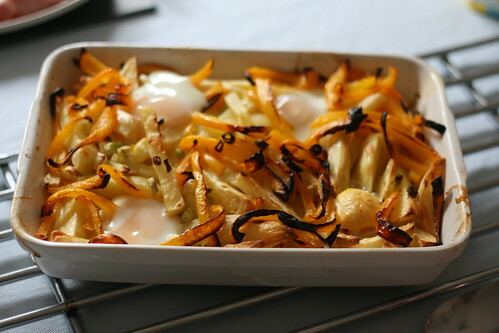 Then you just have to bake until the eggs are cooked to your liking — five minutes for me — and serve! Have it with a salad if you’re feeling virtuous, or baked beans if you’re not….